Definitely take care of your real life stuff first @Cbear13! That's so much more important ! I look forward to your feedback on my practice challenge 1 (all 3 parts) ! @Cbear13 --- I had this almost done, and now, it is complete. 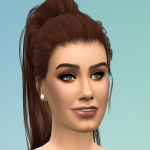 I wanted to post it before I forgot which challenge game it was in --- I have several now because I like to keep what I build, and my non-challenge game is completely full ...lol! Whenever you get to it is fine. #QCpractice --- challenge 2 --- This house if for a boyfriend and girlfriend who have a child. The entire house and yard has a Christmas theme. 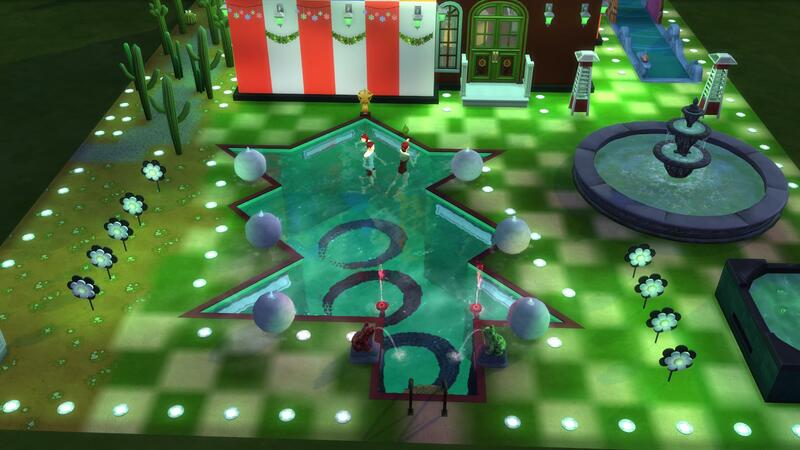 I used the fountain balls as Christmas ornaments on my Christmas tree pool. The 2 froggie fountains are watering the tree’s trunk. Sims climb the pool ladder from the very bottom of the pool’s trunk. I just want to apologise for being so behind here and not getting back to everyone, I am slowly catching up and will be working on some of this today. Thanks a lot for the update ! That's alright @Cbear13 ! I look forward to your feedback on my 2 practice challenge entries ! First impressions of the garden and landscaping is its so beautiful, I love all the use of different trees and variety of plants and flowers. 1. 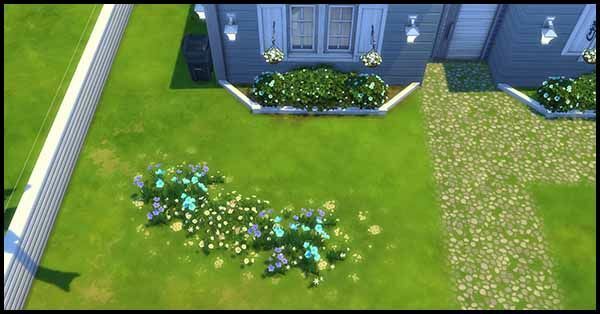 Terrain painting and path - Great job with the terrain painting and using different types, it really does make a garden look more realistic when you put detail in the terrain. I love the use of the dirt around the pond and in garden beds also the use of the other types around the garden to give it a more natural look. Great choice in terrain for the pathing and the fencing lining the pathing does give the garden a bit more of a manicured and clean look. Love the little sitting area behind the pond. If I could suggest something with the pathing I would of connected it from the path to the door to the sitting area behind the pond as it looks quite cut off. 2. The garden beds around the house are beautiful you have beautiful variety of flowers and colors also adding in some other decorations really makes your garden unique. Here you can see the fern leaves sticking through the tree trunk and also the solid stone sticking into it. Using the ALT button (hold down while placing object) you can move them away so they arent touching but still look natural. Also I find a trick with ALT also while holding it down also hold down the left mouse button and move mouse around it will rotate the item you are holding. I use this especially with plants as long leaves like the fern you can rotate it so that it fits closer to the tree without sticking into it. 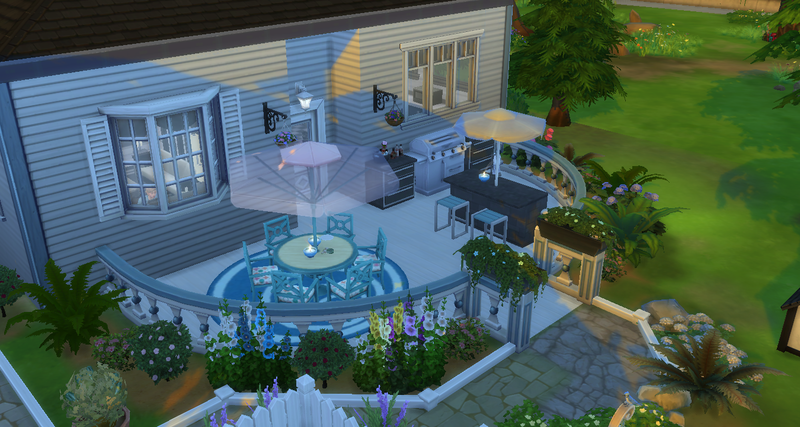 Garden light placement, in the pic below you can see 3 of the garden lights all sticking into other items. One is sticking out of a solid rock, another is sticking into the seat and the 3rd is sticking into Lupin flowers. Make sure they aren't touching anything else as each one will lose you points. Also at the bottom of the pic you can see the Lily of the Valley (white flowers) sticking through solid rock. 3. Your water feature - pond is beautiful and looks very natural great job covering up the trim it does need cleaning up a bit with the flowers sticking into rocks and the lights. 4. 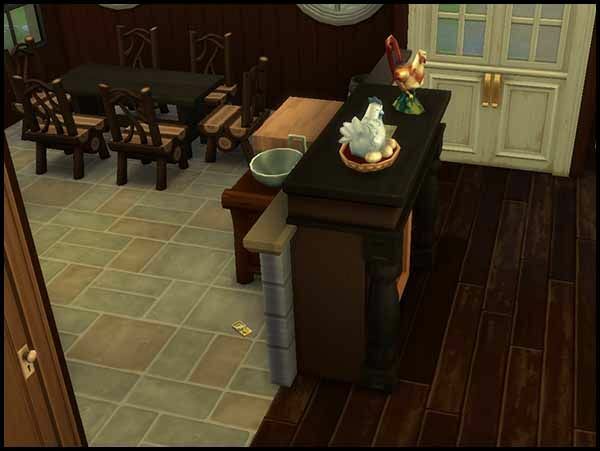 The outdoor seating area is great I love the detail in clutter and decorations and creative table umbrella placed in the counters, always check that the counters are still usable when doing something like this, test that sims can still use and eat on the counters. A tip whenever doing a bbq area or kitchen is always make sure at least one counter is empty for prepping food and placing food on when its cooked. 5. 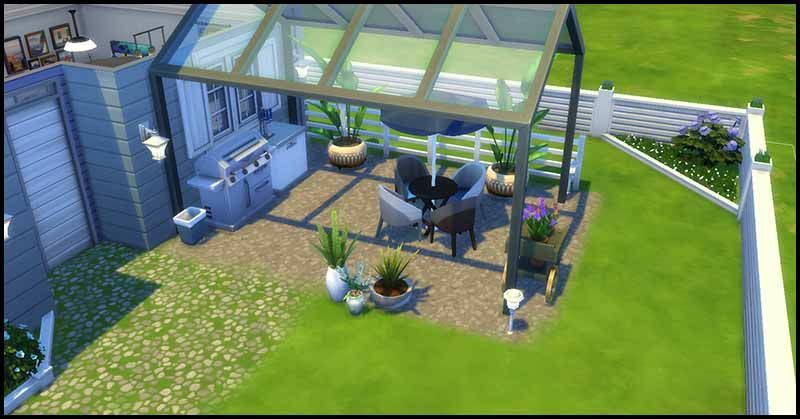 Lastly the vegetable garden, I love that its fenced in but one thing thats great for decoration is having things growing in them, it will help decoration scores and make your garden look much nicer so get a sim to plant and grow some produce before saving lot and uploading. I also loved the creativity placing the hose on the fence. Beautiful garden, great creativity it just needs cleaning up a little with placement. If you plan to do the next part of the challenge and want to fix up part 1 let me know as I can also review this part again. Remember my feedback is based on a judges perspective for the challenges and what your likely to lose points for and also tips on gaining points to. It doesn't mean we are right its just our opinion and to help with challenges. If you please attach the entry form with your challenge post as the information it is is helpful for judging and looking at the entries. Things like knowing which lot you built on so we can judge it on the same lot, sometimes if a build is placed on a different lot things can move and it can cause placement errors which in a challenge will lose points for. So to avoid this we judge on the lot you built on. 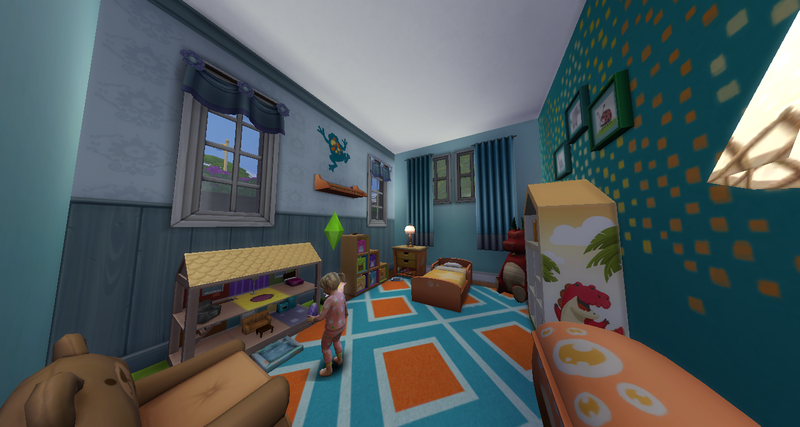 My first impressions in game looking at your house is its simply beautiful, so many different features on it caught my eye and I loved exploring it. 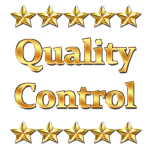 I will write up the feedback for each part of the challenge, remember the feedback is from a judges opinion from the qc comps and I may not be always right but will give you advice on what we would pick up and critique in the real challenges. Also some are opinions of my own personal experience with building and decorating and you may not agree with all advice which is completely fine. I try my best to keep my personal preferences out of the judging. 1. Terrain paint and pathing - Oh I loved your pathing it was detailed, creative and realistic. I loved the use of more than one type of terrain paint and that it wasnt perfectly straight or too clean which really helped making it look realistic. I also loved the use of the dirt around an under the garden beds and pond. I love the use of more different types to do the rear garden and rear patio, fantastic detail and there is nothing I can give you tips on here I think you did an amazing and detailed job. 2. Garden beds - Beautiful variety of flowers an colors and I love that you also included some decorations here and there which makes them more unique. I love that they are fence for a clean manicured look and then on the opposite side of the house is a bit more of a rough garden unfenced. I did find some placement issues which we would of critiqued in a real challenge, we are quite picky on placement had not having solid objects stick into other solid objects. We like things to be as realistic as possible and the reason I do these practice challenges is so you can really get indepth feedback on what we would pick up on. 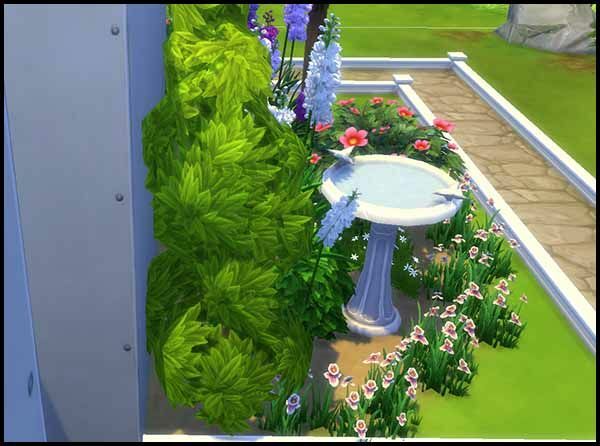 With plants, flowers, rocks or anything really placed near house walls or fences you want to make sure they arent sticking into it or through it. I find a lot of plants and items placed in the games default tiles will stick into walls, foundations and other objects. You can hold down the ALT button when placing items to move them away and put them exactly where you want them so they are not touching. Below you can see some flowers sticking into the front wall of the house and the after pic with me using ALT to move them away enough, make sure when you do move them though that they then don't stick into the small fencing surrounding the garden bed. When I did move the flowers the purple one did stick into the fencing at the front of the garden bed so it would be best to chose a smaller flower to place there instead so it doesnt stick into either. 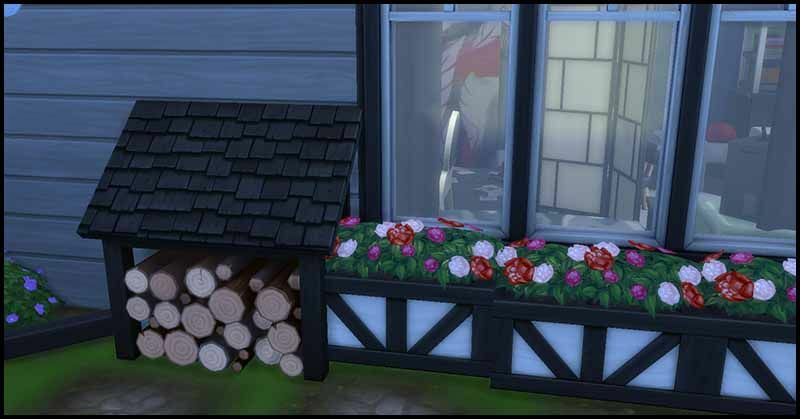 The flower boxes placed under the windows also had plants and items sticking into them and also another window box was sticking into "The Humidor Shed" so just make sure items arent sticking into others. 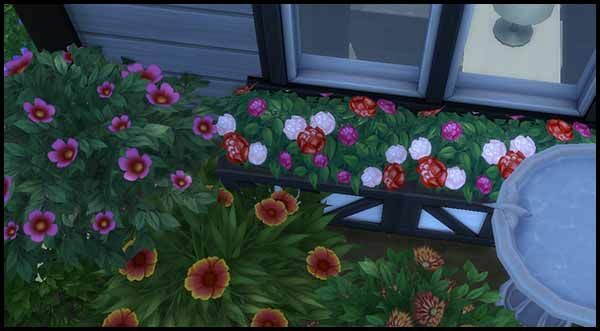 I also found the first window box in the 2nd picture was slightly higher than the rest, this was the case with on the other side of the house to. 3. Water feature - It looks great and very natural with the surrounding rocks, there is one or two plants sticking into the rocks so just be careful there and the carpet used as flooring in the pond was a bit strange, maybe a dirt or rock wall and floor covering would be more natural. I love the use of the lilypads great decoration and natural. While looking at this I noticed the mailbox off to the side in a weird spot so remember to place it near your path to the house. 4. Backyard, seating and bbq - This looks fantastic I love the patio you built with the lattice roofing and I love the fencing in a unique shape surrounding the backyard. Very creative mixing up the fence types. 5. The vegetable garden also looks fantastic I love the design that you built your own planter boxes with fencing and that you planted real produce which is great for decoration. I love that you also included some smaller planter pots. Another thing we judge is night view of exterior and gardens and it really gives a spectacular view at night when everything is lit up, add some garden lights maybe lining your paths or along your garden beds to give a great look at night. Great roofing I love the design and use of so many different pieces. I love the mix of color with the dark brown roofing and trim to the white weather board exterior and the grey use on the roofing panels. Beautiful color scheme on the exterior. As mentioned above we judge night view on exterior and lights double up as great decoration to show you the difference here is before and after of the side of the house. Great decorations used on the exterior with the window boxes, vent and wind chimes and I love your choice of window types they go very well together. 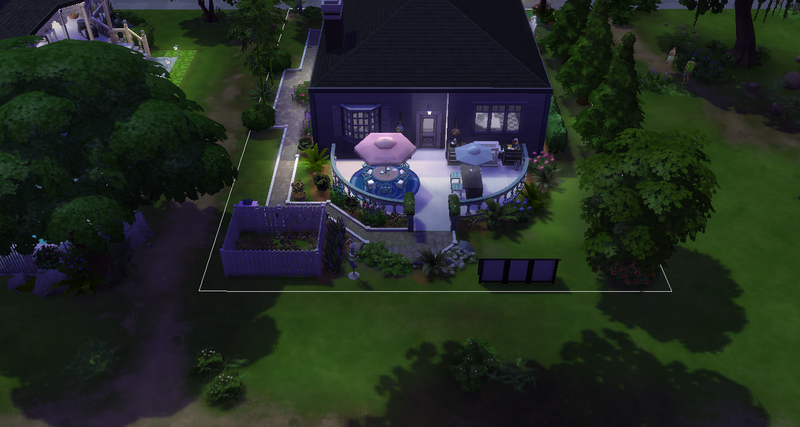 Not much I can give feedback on I think the exterior and roofing looks beautiful. Beautiful color scheme through out the interior I really love the blue, white and black. Careful with curtains and anything placed near it we find a lot of things sticking into curtains when judging the challenges, I found the ""Kids Toys Tub" sticking into the curtain and the "Magazines & Remotes Holder" sticking into curtains in the living room. "Fine Feathered Fern" in the study nook is sticking into wall and wall picture. You definitely have beautiful decorating and design skills so I cant give tips on those as I love how this house is decorated and designed. I would just say be very careful with object placement errors. What a pretty little home it reminds me of a suburban house in a coastal town here. 1. 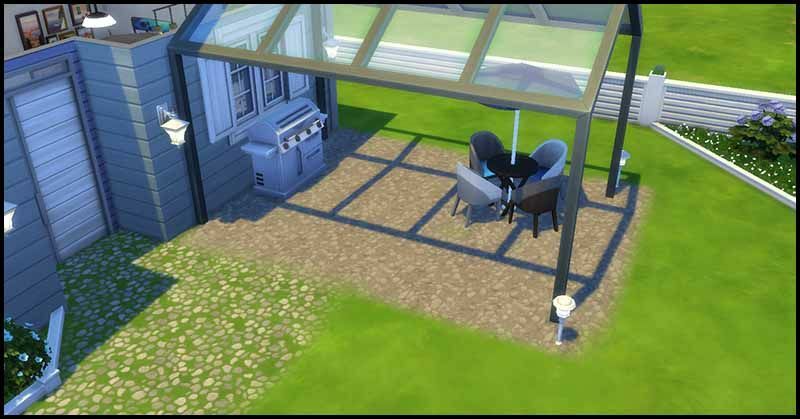 Terrain painting and pathing - I love the choice of terrain paint for the pathing it looks great with this house and love the different choice for the rear patio. Id suggest trying to use some more different types through out the garden as it can make the house look more realistic and natural. For example if you add some dirt touches around or under the garden beds. 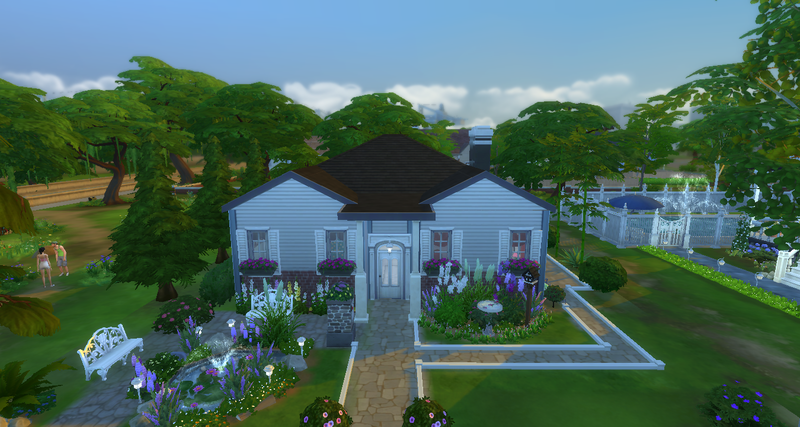 I havent done much in the after pic I only added some dirt in the flower bed in front of the house and some flower terrain paint under the flowers but even some detail can help. The more detail you put in the better to make the garden unique and natural. 2. 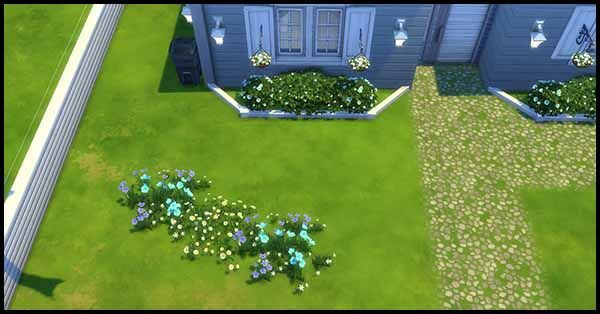 Garden beds - I love the little garden beds up against the house, the hedge of blue flowers were sticking into the wall of the house which would be critiqued in the challenges, you can hold down the ALT button while placing to move them exactly where you want them and avoid sticking into other objects. When using a small fencing around the garden beds make sure the flowers and plants aren't sticking into the fencing either. Several of the "Sunrose Bush" in the other flower beds along side the house were sticking into the walls also. 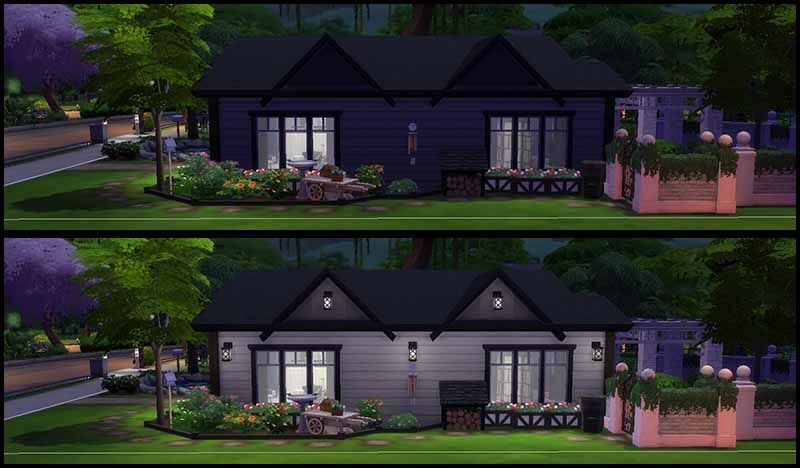 I feel you really could have put a lot more into the landscaping with the left side of the house completely bare of anything you can use rocks or garden decorations also to fill blank areas and give a house more character. 3. Water Feature - Oh what a cute little fountain I love that its surrounded by flowers and a creative shape. Dont forget to put wall and floor coverings in pools and fountains, if making a natural pond try use stone of something that looks natural. 4. Backyard and bbq area - I love that you covered the bbq area with the awning it looks great for a patio roof. What this area does lack is some decoration. Its great to add some outdoor counter with some kitchen utensils or sauces or something on it near the bbq. Also near bbqs and in a kitchen its good to include a blank bench or counter for food to be prepared on and put after cooking. 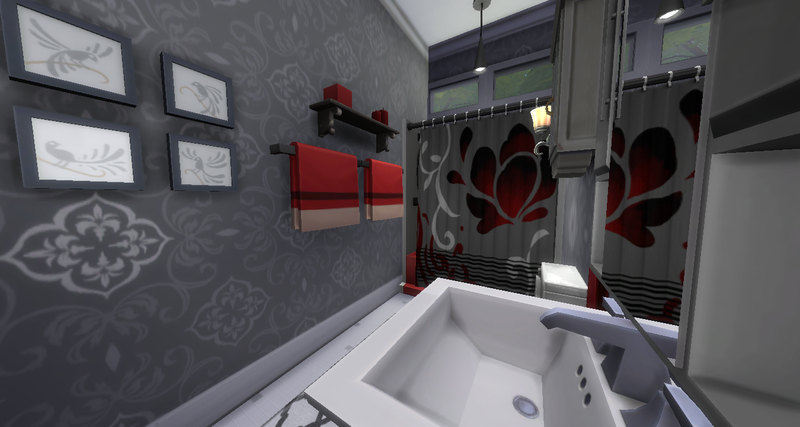 I always say to people when you think you have finished go back and decorate everything some more lol, always zoom out and look for empty spots that can do with some color and decoration and try fill it a bit. 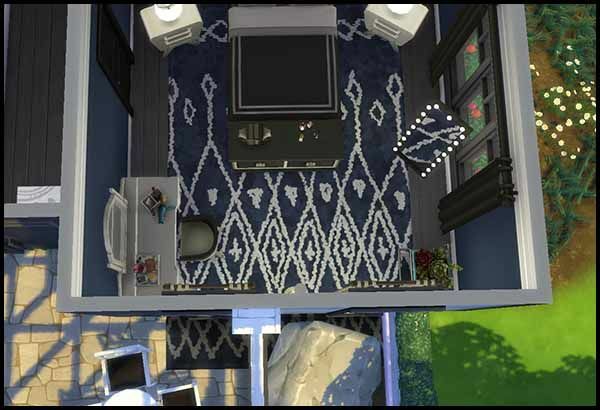 If you dont add decoration and clutter things nothing makes it unique and it will just look like all the other rooms or houses on the gallery. So my biggest suggestion to you would be try decorate and put more detail into areas and landscaping, look for bare areas and fill. 5. 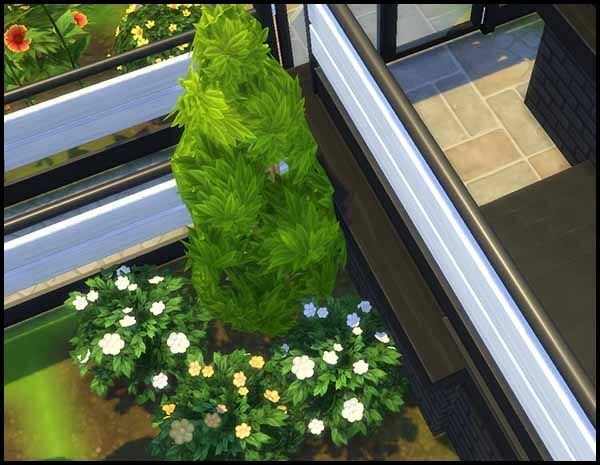 A veggie garden - This is cute I love the path leading in, the small fence surrounding and the added water decoration, I will suggest planting some harvestables with a sim before saving lot and uploading. They add as great decoration to your garden having something growing in your planter boxes. Cute roofing, it is quite simple but it looks good and nice trim. The colors suit the coastal theme you chose. The exterior trim is a great choice for the style to with your second wall covering you could use a darker color to really stand out but it still looks great the choice you made. We also judge night view so I was so happy to see you use exterior lights all around the house, they double as great decoration to. Again maybe a little bare on the left side of the house. The window types look great together and I love the country flowers hanging but it does look a bit odd attaching them to the window shutters but very pretty on the house. The interior is very pretty I love the soft colors you used which fits in with the coastal style and all the blue touches look pretty. 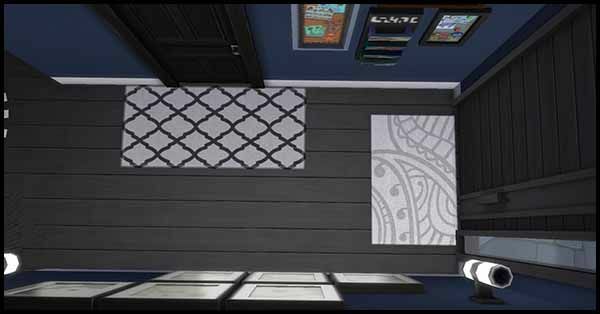 There is quite a lot of the same flooring you could break it up by using carpet in the bedrooms but I love the change in flooring in the living room and the wall covering choices are great, they flow very well together with the different types used. 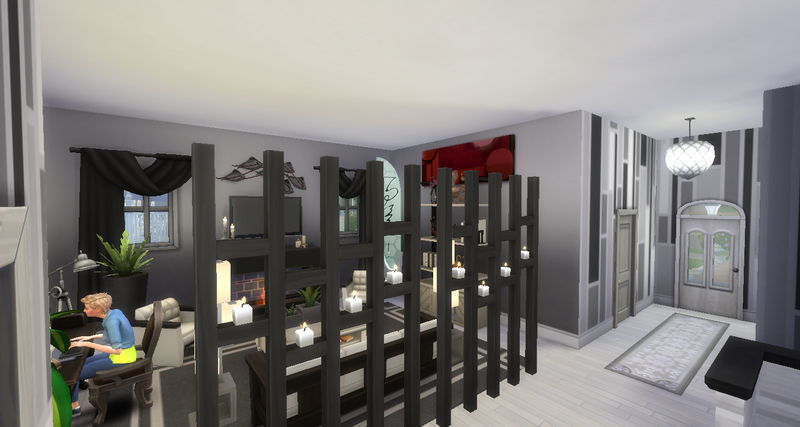 I love the candle divider used as a wall decoration behind the computer desk and I think you did a great job adding decoration and clutter though out the house, it is such a cosy and beautiful house. 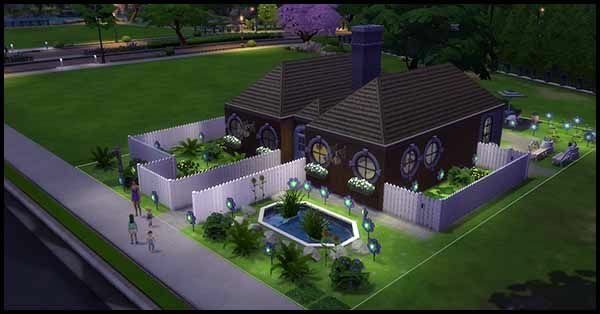 I think mainly just work on fill bare areas especially in the garden and adding more detail and decoration. 1. 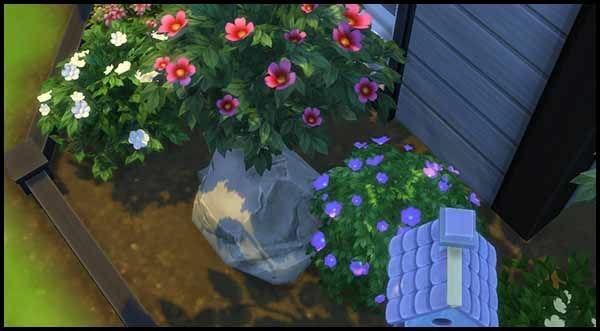 Terrain painting and pathing - I love the use of the "Toe Ticklers" terrain paint around the garden it looks very pretty, you could still mix in a tiny bit of dirt terrain paint near flowers or stones to give it more natural look. With the pathing it was a great choice of stone work though it maybe a little messy in spots. 3. Water feature - Pretty little pond though not really natural looking as rocks surrounding it but not up close, try mix some rocks covering the trim and plants with careful placement you can really make it look like a natural pond. Though as a fountain design it looks great. 4. Backyard, seating and bbq - Cute seating areas I love the little wooden loveseats and love the bits of gardening items on the stone stumps. Nice bbq and seating area you could add some plant pots as decorations on the wood flooring area but you have a lot of decoration with the pinwheels though out. I think sometimes you tend to over do things and may not have needed so many. Not much I can critique on placement is good just clean up the terrain painting and maybe experiment with some dirt near flowers and stones for a more natural look. Pretty mix of colors in the interior I love the deep brown and white. The gardening tools inside the house just looked weird and felt they belonged outside. I also felt the blinds you used in the bathroom didnt suit the style of window and looked a bit odd having the top hanging out. 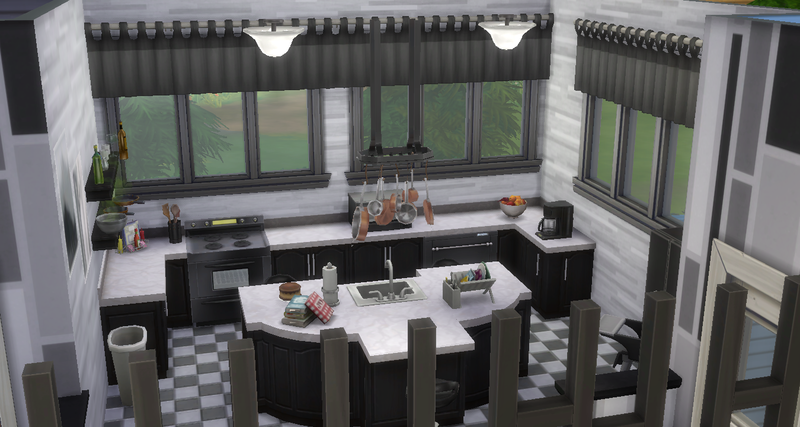 As for the rest of the interior I love it, great choices in decorations and clutter I love all the little touches. Very beautiful house and great decorating. 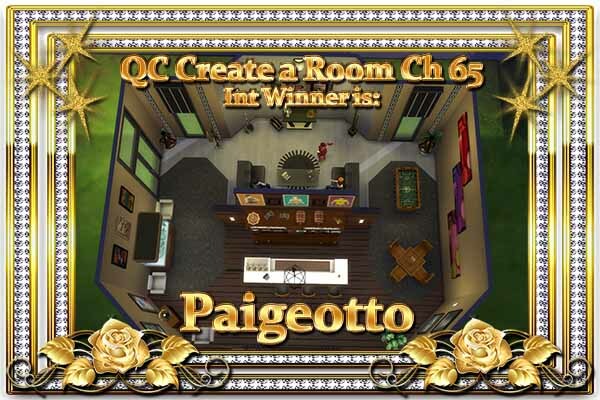 @Paigeotto feedback for Challenge 2, part 1. 1. A pool - Oh what a gorgeous oasis I want to order one for my backyard please hehe. I love this, placement is fantastic, love the variety of plants, great use of rocks to make it look natural, love the island left in the water and great that you included a diving board and ladder. 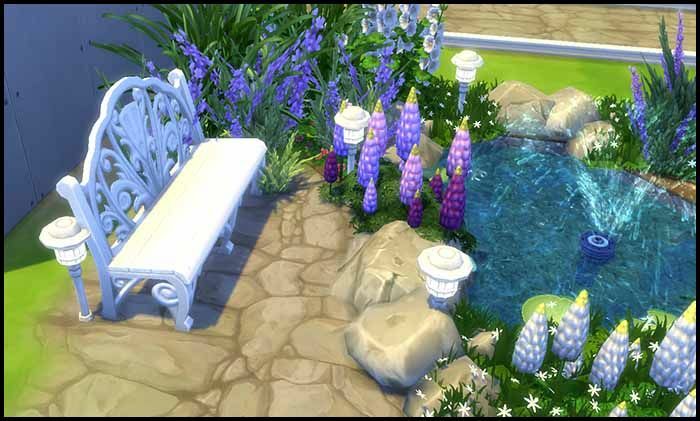 If I could suggest two things, you can add some underwater greenery or rocks on the pool floor to add to the natural feel and also I would add something on the sand in the bare space like some small rugs to look like towels on the sand or some outdoor seating for sims to relax on. There is so much great decoration around the pool and it just looks bare next to it. Also Ive noticed no lights through out the gardens and is very dark at night you can line the paths and light up around the pool to give it a gorgeous night time glow. 2. Terrain painting- I love the sand around the pool area like retreating to a little private oasis. Fantastic use of dirt terrain paint in the garden areas looks very natural. And great choice for your bath and rear patio, I am assuming that is going to turn into a patio and cant wait to see it decorated. It was suppose to be apart of this part of the challenge but hopefully it will be completed in the next part I am eager to see it. 3. The back area was suppose to be apart of this part of the challenge but hopefully it will be completed in the next part I am eager to see it. It would of been great to see it decorated for this part of the challenge. 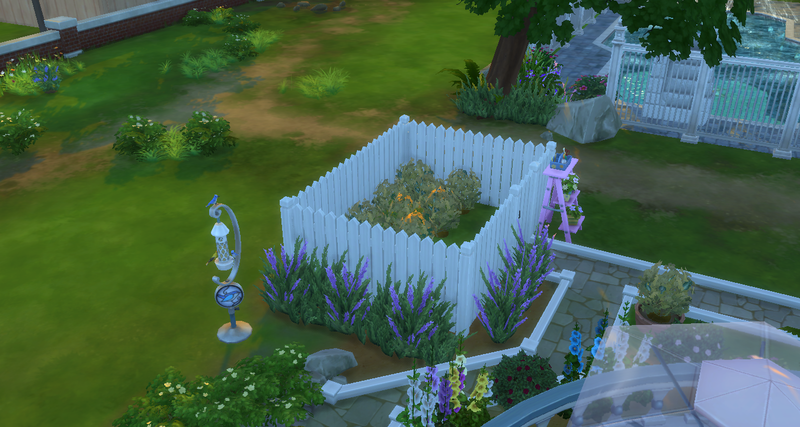 I love the little vegetable garden area and love that you planted harvestable plants in it. I will add more to this part when the rest is complete. Also on the other side of these stairs the daisies were also sticking into foundation. Overall I love it so far it has so many different areas and so unique. Sorry for the lack of pictures and feedback but really you have done such a wonderful job I cant improve on it or give advice. I love that you included fencing all the way around and then added flowers and plants on the outside of the fencing, so many people leave the outside of fencing bare and it looks very plain. 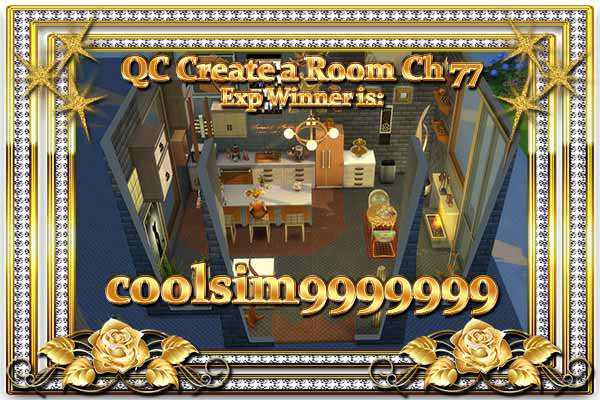 @coolsim9999999 feedback for Challenge 2, all parts. First impression is I think a rainbow exploded on your house lol. I cant say I understand some of your themes and decorations they are so far out of the box which is great creativity but to me its sometimes very hard to judge because they don't always look right or flow well. For the competitions side try make sure that decorations do fit with your theme and not just random items placed because we do judge on style and theme flowing and decorations suiting their environment. As for out of the competitions go crazy with your creativity its good to see such unique builds. I think sometimes you over use things I have noticed mainly with lights, it can make things look over cluttered with to many lights on the ceilings or in this case through the garden floors. Although it is well lit at night I think a bit less would of been fine. 1. A pool - Very creative shape looks like a Christmas tree, love the fountains surrounding it and the frogs near the ladder. Nice decorations on the pool floor and great use of lights in the water. 2. Terrain painting - Well I cant say you were short of detail lol, great patterns, very creative. I have to say I love your creativity but if your going to do patterns or detail make sure its clean. The terrain painting gets very messy in some areas like around the big fountain and some parts around the pool. Also it doesn't quite fit in with any kind of surroundings having a mix of grass, beach type sand and desert type. It just doesn't flow and suit its surroundings. 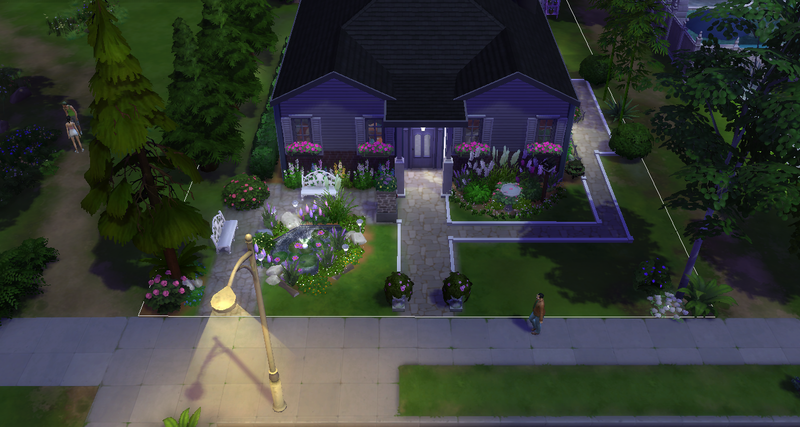 I do love the pathing to the side of the house with the cacti and pretty flower beds at the front of the house. 3. 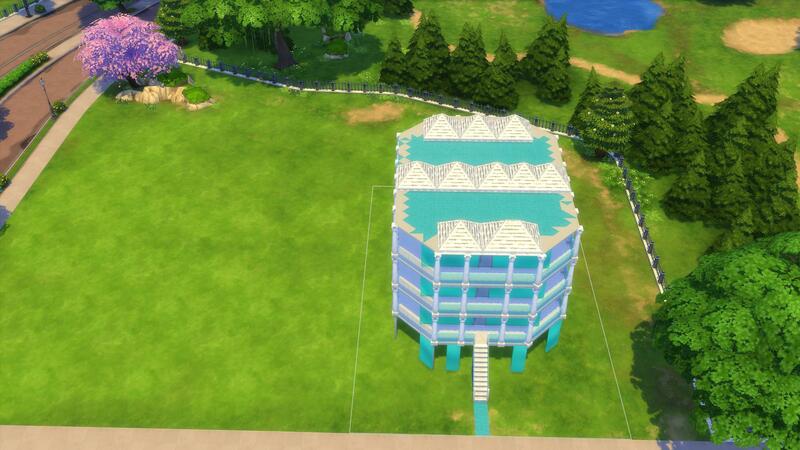 The water slide is a great touch and fun for sims, the spa is a great addition to though seems a bit randomly placed and would of been nice to decorate its own area maybe by fencing it in and putting some relaxing seating nearby. 1. The challenge called for a lattice style roofing over the patio that wraps around the house which it has no roofing at all. The lattice roofing on the top is done well and I like the Christmas tree in the centre. The house exterior is well colorful lol Im assuming the theme is Christmas. I think you over did it with the exterior lights and some seem randomly placed. I love the creative roofing pieces. Some nice exterior decorations. I think a hard challenge for you would be to build a normal looking house haha. I like the fun roof top with the bar, dance floor and banquet table. Nice variety of window types. Again I think over use of ceiling lights and wall lights and random placement you really only need to place one in the center of a room. I love the different types of curtains used. 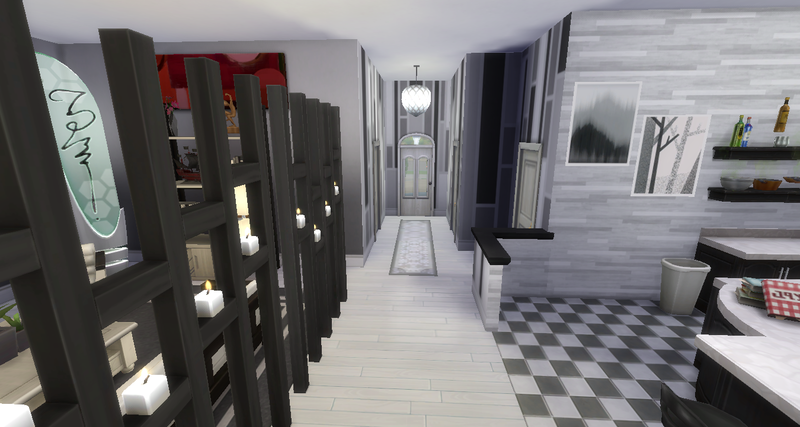 So my overall tips is try make your houses flow a bit more with style and decoration, don't use so many ceiling lights and place them in a suitable spot instead of random places. Love your creativity just try to control it a bit more than just being a bit messy and random. Thank you very much for your feedback on my practice challenges 1 and 2 all parts @Cbear13! I'm really happy that you liked what I did. 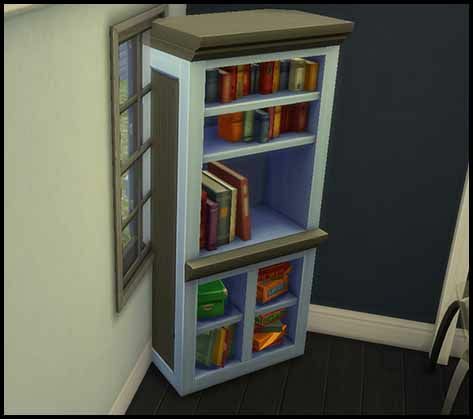 Your feedback was very helpful, and I will incorporate it into my builds! 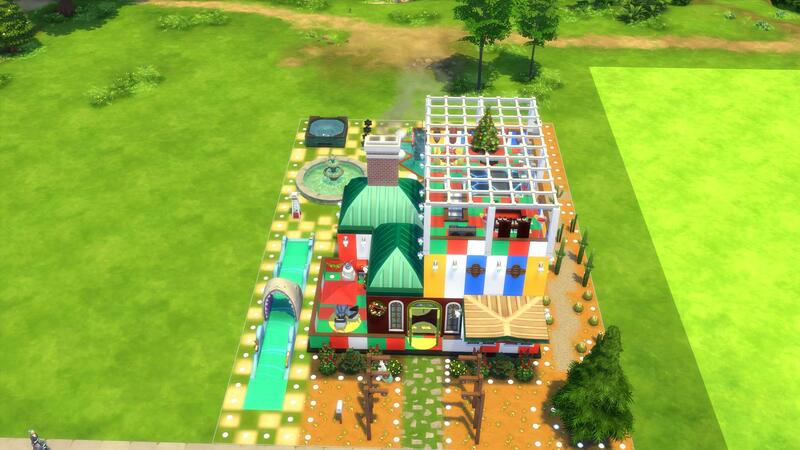 I think I found the "square" terrain paint tool the day I did QC Practice Challenge 1...lol ! Now, I'm a lot better at it ! P.S. I do have plenty of normal houses , but they're all from before I learned how to use Alt. Haha, I thought I was doing something wrong. I was like, "Man, this looks really bare." But I have already almost finished the second part of the challenge. @Cbear13 I think you may have missed the last part of the first challenge. It will be nice once I am able to embed photos. Thank you so much though for taking the time to do this. I really really appreciate it and I hope everything is going well for you. I didn't decorate anything in the house including the little patio in the front and the top patio. I wanted to leave those for when I am decorating within the shell. I love love love this build and I hope you enjoy it as well. 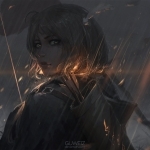 @Cbear13 --- Whenever you have time to give me feedback for this is fine ! I'm trying to enter the 3rd challenge, but i don't know how to private message?? I have made corrections to part 1, if you could re review for me please. This is developed for a Divorced Mother and her toddler daughter. 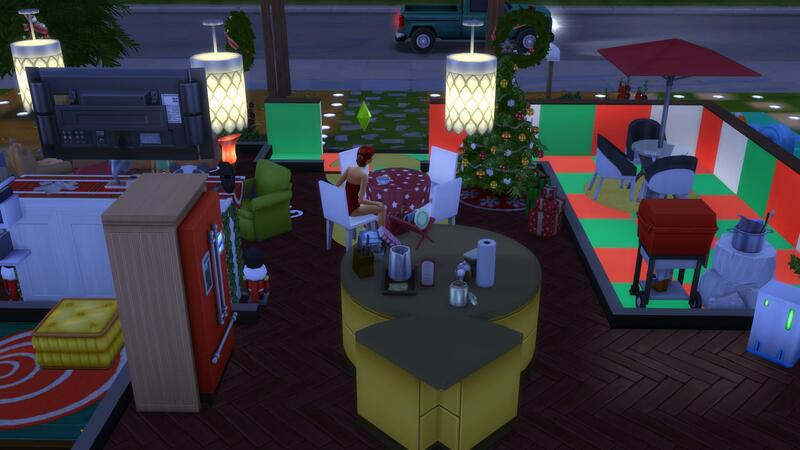 She made out in the divorce, so she bought a beautiful house with all new furniture for her and her daughter. It has a more modern feel, with the exceptions of some heirloom family pieces. Thank you so much @Cbear13 for taking time to do this. It is so helpful to learn to build better buildings. @Cbear13 Thanks for the feedback! I'll be sure to use it in future builds and challenges. This was my first time trying one of these and I look forward to doing more. @Paigeotto oops I did miss Challenge 1 - part 3 it will be great when you can post pics haha that might be why I missed it. I will get to it after i finish judging the latest qc comp challenges. @leashahampton you can post on here and request feedback to be sent to you in private if your not wanting it posted on the thread and cant message me. I can send you a message that you can reply to if that will help? oops @Cbear13. I will do full parts from now on. 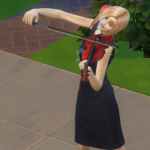 How many practice challenges are there --- not that I'm going to do them all at once if there are a lot? Thanks a lot @Cbear13 !